Design Thinking in the Era of Live Operations. Assume you are looking at a photo. Or listening to music. Or watching a movie. Or playing a video-game. Can you specifically tell what is it that makes you like or dislike the media or any form of art you’re experiencing? Most of us don’t. We simply like or dislike things without going in details, armed with measuring sticks, while asking ourselves what triggered those feelings. Some time back a colleague told us he was visiting an art museum in Vienna. He was blazing through different galleries and at one point he felt like he wanted to check the name of the artist of a specific painting because he suddenly felt he really loved what he was seeing. It was Rembrandt. He had no education in art. For him art was expressed in terms of “I like this” and “I don’t like this”. Binary. A specialist could pinpoint what elements in those paintings made him “like them”: composition, colors, balance, tones or the emotions of the characters portrayed. These elements combined would ultimately trigger a feeling from the audience. In video games, rational game design is about combining the crucial elements that create the feeling the designer wanted to convey through his content. Rational Game Design is all about focusing on the crucial gameplay elements and removing unnecessary information. The objectives and mechanics must be clear, readable and introduced in an orderly fashion. Another main point of the rational game design is to preserve the learning and difficulty curves of a game that will ultimately make it suitable for a broader audience. When executing live operations for puzzle Free to Play games, the biggest aim is to create and maintain a balanced experience for the players. As they progress through the game, their skill level increases and ideally the challenges they complete should also increase in difficulty. Giving the players a challenge that’s lower than their current skill, they will get bored. Whereas giving them a challenge that is way higher that their current skill level, will get them frustrated. They will probably never open that game again, because they don’t feel like doing so. If they will easily win levels then the game is not for them because they feel smarter. If they easily lose levels then the game is not for them because the game makes them feel less motivated. It’s a must to keep the user base in the flow area. The creative challenge here is to make the player stay in the zone. That’s the function that we want to achieve from our content. In order to shape it and give it a form it’s important to perform some additional steps. In Live Ops we work with products that have been designed long before we took over. At that point, we can start deconstructing them into small, tiny particles that, when combined create learnable, exciting, fun and balanced experiences — while making sure we’re not alienating the existing user base. To understand an existing product, we consider the required skills and inputs given in any game situation. 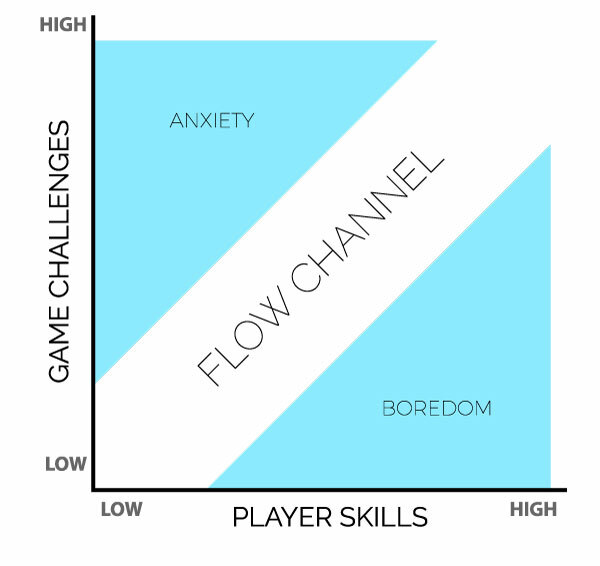 By breaking down the inputs and the complexity of skills involved it is easier to rationalize the way in which challenges are given to the players. Thus, keeping them from being stuck in a sequence or level that they cannot escape or get past due to the level of complexity required that was not obtained. Games nowadays have become accessible, with broad audiences that come from diverse cultures, different ages and have broad skill levels. The goal is to satisfy them as much as possible, regardless of their skills or play preferences. Nowadays we design additional systems that help us identifying high skilled or low skilled players, adjusting the content accordingly to provide optimal experience. Getting back to the initial topic — form follows function. This design principle is the foundation of our content creation. First, we lay out the functions that our content needs to achieve. Then, we look in the bucket of game mechanics, ingredients and parameters for the perfect mix to achieve the optimal experience. The main function of our content is difficulty. It dictates the challenge that is given to our players. To understand it, first, we must have an abstract approach. Most of the F2P Puzzle games have a simple yet, overwhelmingly complex goal: Beat this level objective within the target number of moves. That means that our players must achieve a certain amount of the level objective with each move they make. Going further, we can limit the total number of possible moves by using things like “empty slots” or “blocker” tiles, each having a different function. While empty slots will forever deny any possible move, blockers will act as a temporary barrier, making the player have a secondary (or in some cases primary) objective to eliminate them prior to attempting to complete the level’s objective. With this logic, a level that features “empty slots” should be harder than a level that features “blocker” tiles, and both previous levels should be easier than a level that has both ingredients — both blocker tiles and empty slots. So, in an abstract manner, easier levels should not punish the players for doing some unnecessary moves (moves that do not contribute to the level goal) — while difficult levels should be ruthless. There’s one more catch here: the players should not lose levels, they should always feel they almost won them. Think of it like a one-armed bandit slot machine, if the first two reels have stopped and they are sevens but the third reel has stopped last on something else, how will the player feel? Will the feeling be about losing 5 cents or about almost winning the big prize? That’s why — as a best practice — this feeling should convey towards the users. It will make the user base feel better about themselves, and others try to use some helpers to fill that gap. Back to difficulty — we design levels in batches and we are always keeping their intended difficulty in mind — a series of mountains and valleys in terms of how hard or easy the levels should be. We craft these mountains (difficult levels) by combining mechanics or ingredient that are complex, thus making our players play them several times before they achieve success. Valleys (easier levels) are places where we let the players breathe, enjoy the content and relieve frustration caused by previous harder levels. We first design the functions that our content needs to satisfy (difficulty, tutorial, practice, etc.) then with this in mind we deliver the final content form by blending together either physical or mental challenges, core game mechanics or exotic ones. And our biggest ally is the humble spreadsheet. Below is just a small example of how we are planning the content, with focus on bringing variety in the design of the levels. Let’s say there is an assignment to create level 100 — the level must feature Ingredients #1 and #4, its overall difficulty needs to be Easy. Level 102 on the other hand will bring a bit of variety by featuring another ingredient #3 and having blocker tiles to add a bit of difficulty in the mix. Rationalizing each ingredient impact on difficulty helps you in crafting the perfect difficulty curve. Creating a variety matrix will help keep game ingredients fresh and sometimes create interesting patterns that a designer wouldn’t have created. Always convey a function from the content you are creating and apply a form over it to satisfy both user and development needs.